At about one inch in diameter and traveling almost the entire length of the trunk, the aorta is the largest artery in the human body. The aorta also has the thickest walls of any blood vessel in the body. This artery ascends superiorly from the left ventricle of the heart, arches over the heart and to the back and to the left, and descends inferiorly behind the heart just anterior to the spinal column. Following the aorta from its origin at the left ventricle of the heart, the first section of the aorta is known as the ascending aorta. The ascending aorta branches into the left and right coronary arteries. The coronary arteries carry blood to the surface of the heart so that it has oxygen and nutrients to keep beating. - the left subclavian artery. The brachiocephalic trunk supplies blood to the right arm and right side of the head, including the brain. The left common carotid artery supplies blood to the left side of the head, also including the brain. Finally, the left subclavian artery carries blood to the left arm. The descending aorta carries blood through the thoracic and abdominal cavities of the body until it splits into the left and right common iliac arteries, which supply blood to the legs. 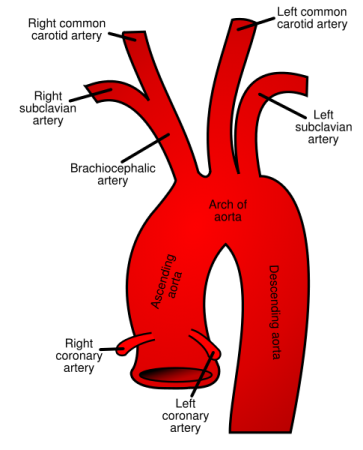 The descending aorta is broken down into two sections – the thoracic aorta and abdominal aorta – named after the body cavities that it passes through. The abdominal aorta branches off into many smaller arteries that feed the major abdominal organs. The aorta carries all of the oxygenated blood exiting the heart in the systemic loop of the circulatory system. Thus, the aorta provides oxygenated blood flow to all of the tissues of the body. The wall of the aorta is very thick and elastic, which allows it to withstand very high blood pressures and to stretch with every heartbeat to receive a large volume of blood. After filling with blood, the stretched aorta contracts to its original diameter and pushes blood into the arteries that branch off from it. Due to the high pressure that arteries must endure, weak spots in the arterial wall can lead to a ballooning of the artery called an aneurysm. Aneurysms stretch out over time as blood pressure pushes on the arterial wall and this stretching can eventually lead to a rupture of the arterial wall. Small aneurysms can be patched, but large aneurysms can lead to a potentially deadly tearing of the aorta known as an aortic dissection. Cholesterol in the blood can cling to the walls of the aorta and other arteries where it is calcified and forms a hard substance called plaque. This process is call atherosclerosis, and occurs throughout life from birth until death.